Abbey Gardens stand in the heart of Bury St Edmunds on the site of a great Benedictine abbey. The gardens contain magnificent floral displays and impressive ruins of the abbey. They stand adjacent to St Edmundsbury cathedral that is only now in the final stages of completion after nearly 500 years with the addition of a central tower. 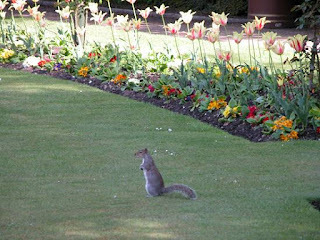 If you sit on a park bench, the beautiful squirrels will come right up to you. They are a joy to watch as they play in the lovely grounds of the Abbey. PLEASE HELP PROTECT ME FROM THE CONSERVATIONISTS AND DEFRA!